Tag Archives: How fast can water kefirgrains grow ? Kefir grains can be stressed, what can I do ? First, what is the optimal kefir grains to water ratio ? Kefir will usually starts to yeast between a ratio from 1:10 to 1:18. This means that 1 tablespoon of kefir grains will ferment at about 1 cup of sugar water and may increase over time to a ratio of 01:24 (= 1 tablespoon kefir grains in 1,5 cup of water). 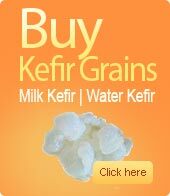 For starters, try using a ratio of water to kefir grains of about 1:16 to 1:18. We note that in the winter the kefir grains grow less rapidly than in the summer. 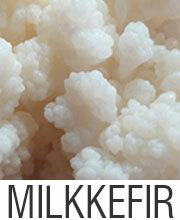 In summer kefir grains can grow about 300% grow within 48 hours, while in winter an increase of 5% may be normal. It is also appropriate for starters NOT to begin immediately with dried fruit. 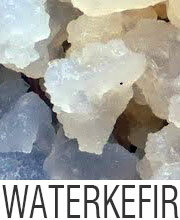 Water kefir grains need time to adapt to their new environment and change of foods. Therefore we start with a sugar solution without the addition of dried fruit. What is the optimal water to sugar ratio for water kefir ? The optimal ratio is dissolved about 5 to 10% sugar in water, which is approximately 1 tablespoon sugar per 1 cup of water. Make sure the sugar is well dissolved. Please use unrefined sugar, often dark in color and may have a slightly salty taste because of the minerals present. These minerals are essential to obtain a good kefir culture. Provide an ideal temperature of 18º to 28ºC, even when creating a new batch, this is important. Customize tempered sugar water to its environment (room temperature) before mixing with the kefir grains. Above tips may be useful as a starter, but nothing stands in your way to start finding the ideal proportions. Tagged How fast can water kefirgrains grow ?, How revive water kefirgrains after shipment ?, Kefir grains, What's the ratio of kefirgrains to water ?